The truth is: we don't know much about what "will be." Here are six mindfulness tips for going with the flow—rather than losing ourselves in the undertow. Change comes whether we want it or not. If we can stay open and curious to an ever-new landscape of life’s possibilities, change can actually be the key to resilience. By learning to explore what presents itself, we ride the waves of change rather than losing ourselves in the undertow. By learning to explore what presents itself, we ride the waves of change rather than losing ourselves in the undertow. As we make the conscious choice to stay open, raw, and vulnerable, we can be brave, tender, and present to the technicolor experiences that reveal life’s texture and richness. The key to mindfulness is training ourselves to notice the details: Which thoughts are here? Which emotions? Which body sensations? As we stop trying to resist what’s coming our way, we can become scientists of our own experience—full of wonder at each new discovery. Considering that adaptation is at the heart of survival, it’s surprising how afraid we are to let things evolve. If we learn to adapt, allowing new information (and challenges) to expand our perspective rather than retreating into ourselves, our unique brilliance can move along with life’s flow. At the end of the day, most of us just want to feel better. When we allow ourselves to be gently present, we may notice an increase in energy, joy, and resilience as we dare to explore the vividness of life. As we investigate our assumptions, judgments, and other narrow ways of thinking, we open opportunities to develop insights that expand and re-charge our views. It’s important to be open to change, but that doesn’t mean we should be constantly striving for change or forcing it on ourselves. Riding the waves of change means being here for what arises naturally—not moving at breakneck speed toward the next thing and the next thing. Life can so easily slip past us unnoticed. Remember to pause, take a breath, and appreciate the electric circus called life. 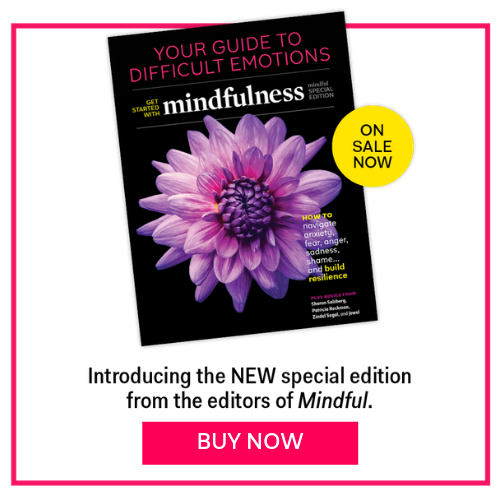 This web extra provides additional information related to an article titled, “Easy Come, Easy Go,” which appeared in the December 2017 issue of Mindful magazine.